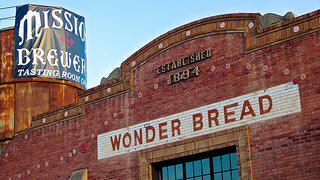 Mission Brewery has been housed in this rehabilitated Wonder Bread factory in San Diego's East Village since 2011. How do you like your root beer? Chilled, over ice, in a frosted mug, or…with a kick? 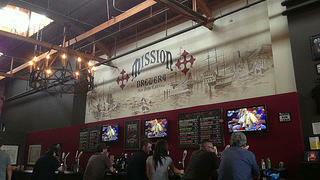 If you prefer the latter, then the Mission Brewery in San Diego may be your ideal watering hole. Originally founded in 1913, the brewery was shuttered during Prohibition and revived in 2007 by Dan Selis, who had been dabbling in craft brewing for 25 years before starting his own business. Mission currently prides itself on its alcoholic take on root beer, as well as nine flagship beers, six craft cocktails served in the tasting room, and two seasonal brews. Beers like the Mission Blonde and the Shipwrecked Double IPA have made Mission one of the most renowned craft breweries in the region, and customers who enjoy a heavy pour will find themselves right at home. Try a rotating selection of brews in the tasting room, as well as craft cocktails. While Mission Brewery is no longer located in its original, pre-Prohibition-era building, which had the distinction of being the only Mission Revival-style industrial building in the city (it's since been redeveloped into an apartment complex), that doesn’t make its current setting any less historic. 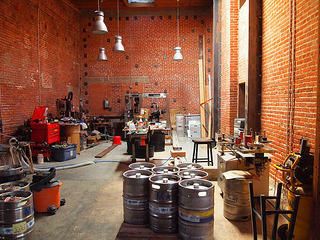 It is now housed in an 1894 former Wonder Bread factory in the city's East Village, near the Gaslamp Quarter. Wood-trestle ceilings accent the building’s red brick walls, and a 2,500-square-foot tasting room ensures that there's enough room for up to 400 guests. As an added bonus, the tasting room overlooks the brewhouse, so you can see the product being made as you sip it. If you're coming to or leaving from a San Diego Padres game, Mission Brewery is the perfect pit stop -- it's located right next to Petco Park. The red brick Wonder Bread factory features over 10,000 feet of space. As well as being a renowned brewery, Mission is a community hub, with weekly events like trivia, dog-friendly Yappy Hour and "hoppy" yoga. With distribution in ten states outside of California and over 30 national beer awards under its belt, Mission is also the only brewery in the country to distribute its beer in a (massive) 32-oz. "sharing size" can. From its pre-Prohibition origins to its newest incarnation in a revitalized industrial building, it doesn't get much better than Mission for craft beer lovers in Southern California. Brewery tours are available on Fridays, Saturdays, and Sundays, are run $10 per person. Check out these helpful tips below before you go. Hours: Sunday-Thursday, noon-10 p.m. Friday-Saturday, noon-midnight. You're having: The Cortez Gold, a Belgian Blonde-style ale, or, for something a little stronger, the Carrack Imperial Red Ale. Alternately, try the Hard Root Beer or a frozen orange lemonade. If you're hungry, check out the selection of food trucks that are frequently parked outside. Best Yelp review: "What an incredible building providing cover for some pretty good beer. Curved bar, old shuffle board table and killer natural lighting. Haven't had a soda in years but the hard root beer was fun! Check out Tall Rob...he'll patiently guide you through the choices and help you find 'your flavor' at Mission Brewery."